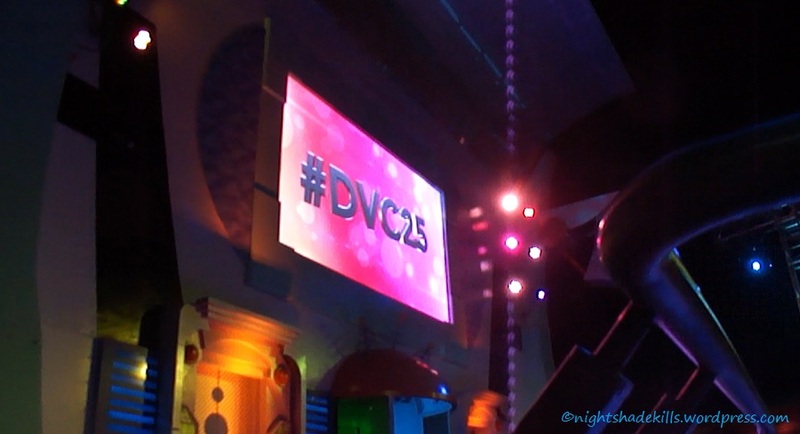 Watch the explosive finale of the DVC 25th Anniversary Magic Kingdom Private Party! 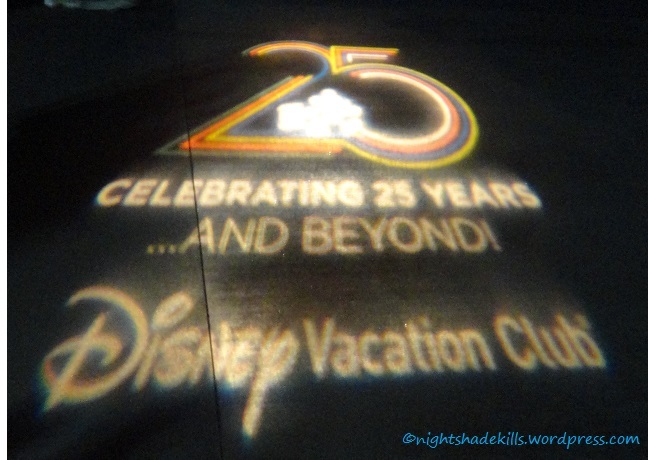 I had gotten a reservation for the DVC 25th Anniversary Party back at the beginning of February by calling Member Services. Luckily there was still space available at the time and I didn’t have any trouble. Although there was no fee for this event, space was limited. Event check-in was simple, a section at the front gate was dedicated the Event entry, where they check your credentials and provide each attendee with a special wrist band. Event programs were provided as well, the program just outlined where the character meet and greets were and where the refreshment stands were set up, the location of the dance party, and which rides would be open. Party was scheduled to start at 9:30. 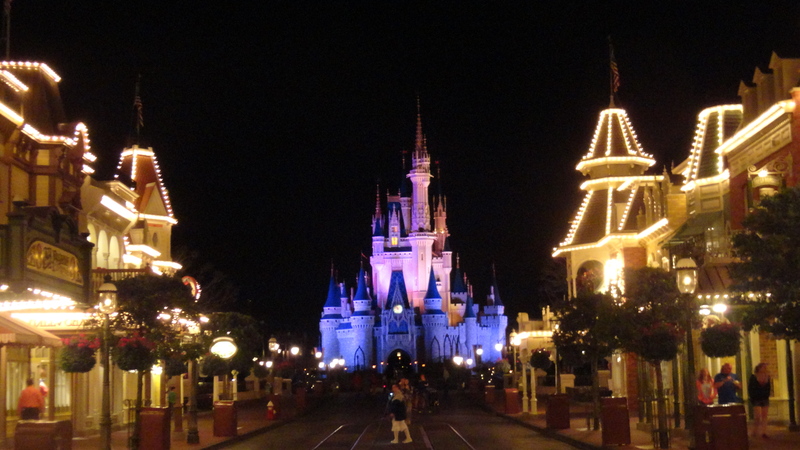 Magic Kingdom officially closed at 9:00 pm to regular theme park guests. DVC attendees and their guests could enter as early as 7:00 pm and enjoy the whole park before the party started. Once the party started, Adventureland and Frontierland would be closed. Magic Kingdom was crowded during the regular park hours, which is completely normal. We headed over to Adventureland, but stopped to watch the Castle projections for 5 minutes, then kept walking towards Pecos Bill’s. I was interested in trying something off the new menu, but the lines at Pecos Bill’s were really long; 4 registers open, but still at least 8 people deep at each line. No thanks. Decided to go to Columbia Harbor House instead. Got there, a few people blocking the entrance just trying to figure out if they were eating there or not, and asking the cast member at the door if they needed a reservation (internal monologue – “pfft, reservations, what are you talking about?!”). WDW must be confusing for newbies. Evasively walked past so they didn’t get in front of me and got in line. I’m grumpy when I’m hungry. 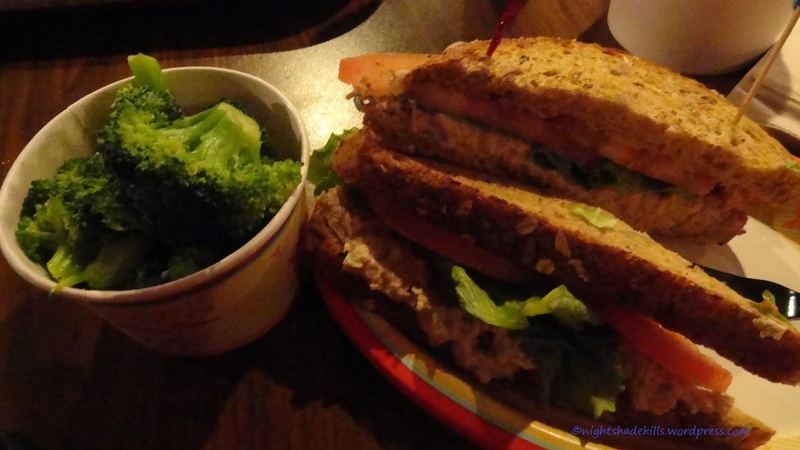 Ordered a Tuna Sandwich with Broccoli – yay! Was excited not to eat fries. 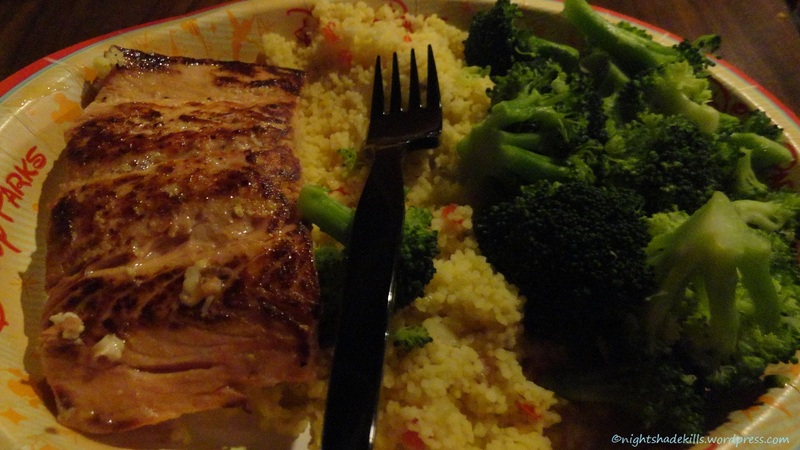 Ordered a Clam Chowder to share, husband ordered the Salmon dinner. Went upstairs and got a table in the front section that overlooks Liberty Square. 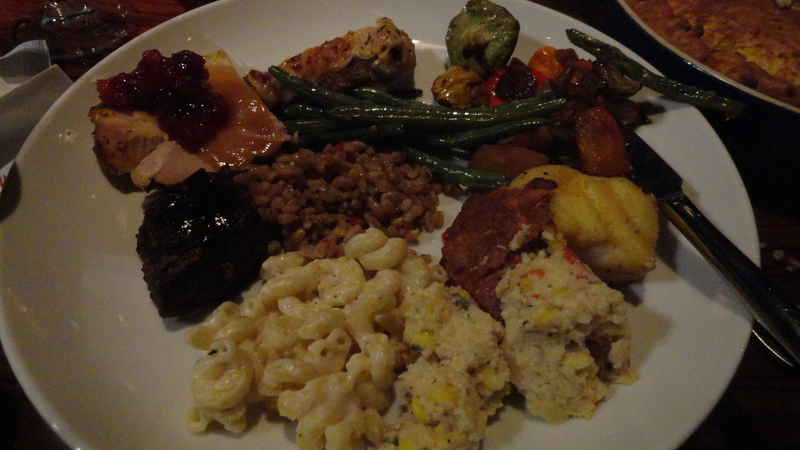 I had to eat very slowly as I have been dealing with tooth pain. Seemed like everyone around was wearing DVC party wrist bands. There were some tables set up near the Carousel with loads of people crowding them, these were the refreshment tables and I couldn’t really get a good look at them. We decided to walk further, we had just ate anyways, and we saw Prince John, Robin Hood, and Friar Tuck! These characters are pretty rare, I have never seen them in the parks before, and we really love that movie, so we got in line. We had to wait about 35 minutes, they had to take a short watering break for about 5 minutes. Overall it wasn’t that bad of a wait, they were really cute. I didn’t get to interact much, just get in place and smile for the camera and done. But, it was fun to watch them. Friar Tuck had been blessing people and making the sign of the cross. Prince John was kissing some hands. 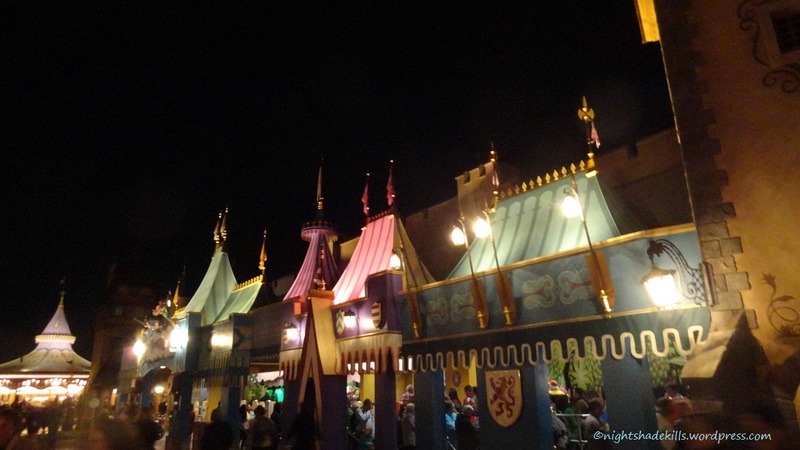 Next, we walked over to the Be Our Guest area, more refreshment tables with no waiting. 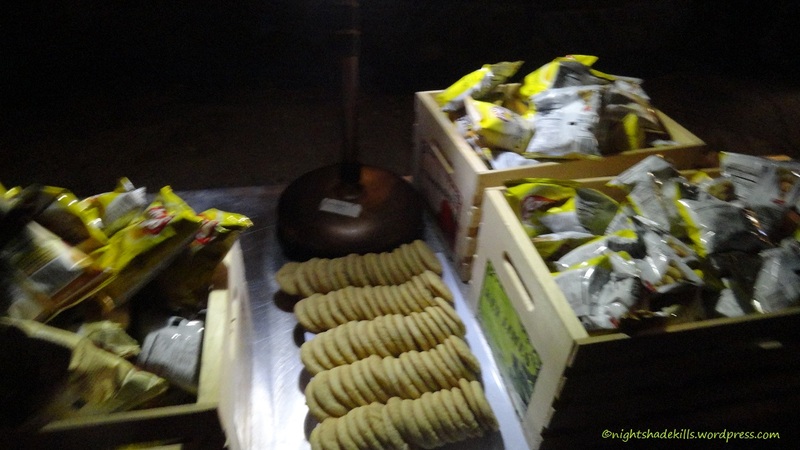 There were three kinds of potato chips, Baked Lays, Classic Lays, Miss Vickie’s BBQ Kettle Chips, chocolate chip and sugar cookies. Lemonade and Zephyrhills Water to drink. We helped ourselves to some Baked Lays and drinks and sat down. All the while just thinking about how incredibly cool this was to be there, all these people were DVC members (or guest of DVC members), wow. The weather was a little nippy but not too cold that it was causing any discomfort, we had enough layers on to keep warm. We wanted to keep walking around and see what else was going on. We headed towards Gaston’s and saw an ice cream cart and the cast member was giving out FREE ice cream?! What?! We walked up to see if that was indeed the case, and sure enough, Free Mickey Bars, Mickey Ice Cream Sandwiches, Mango and/or Strawberry bars! Wow. We excitedly asked for two Mickey Bars and then found a nice spot near Ariel’s ride to eat them. Nearby a castmember was giving out DVC 25th Anniversary buttons, so we each got a button, a nice keepsake to add to my button collection. We then walked towards the Circus area, and saw there were a couple characters, which happened to be Darkwing Duck and Launchpad. Pretty neat, haven’t seen either one of them before in person. 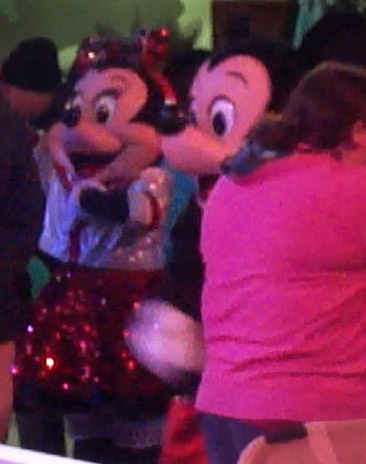 We still hadn’t seen the dance party, so we went over to Tomorrowland where the DJ was, and to my surprise I saw Mickey, Minnie, Pluto and Goofy! All of them together, that was cool. I took a little video of them dancing. Over towards Buzz Lightyear’s ride, we spotted Beymax! The line wasn’t very long here. He was so cute, especially when he was walking, he was taking such tiny steps, it was adorable. We went back around through the center hub and went back to Haunted Mansion and saw the Cadaver Dans! Didn’t even know about them at all! I have never seen them before. 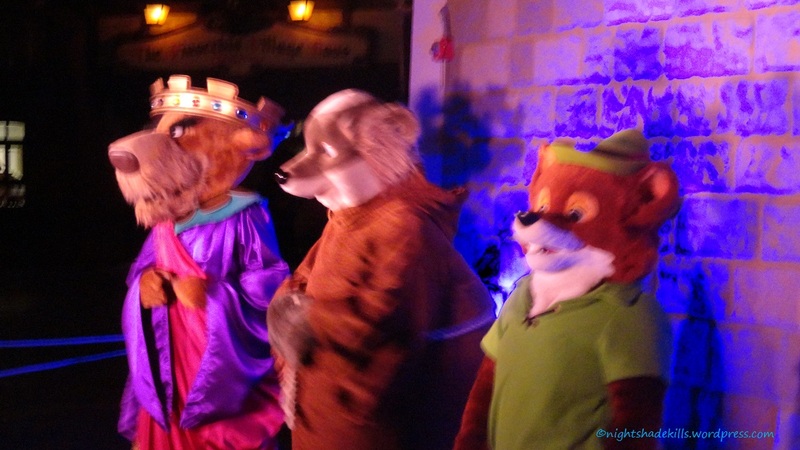 When I got home I did some research and found out they only perform during the Mickey’s Not So Scary Halloween Party, and they roam around, which is probably why we have never seen them before. Definitely worth watching. Was one of the coolest things I’ve ever seen at WDW. After the fireworks there was about 20 minutes left, we headed back to Haunted Mansion, grabbed an ice cream at the nearby cart and wandered around, while we were near the Seven Dwarf Mine Train, I had the urge to get in line, never been on it before! I had to ride solo, since my husband doesn’t like fast rides, plus since neither of us had ridden it, we didn’t know what to expect. So, I would be the one to test it out. With two minutes to midnight, I got in line and in less than 15 minutes got onto the ride. The line queue was really cool, loved the gems. The line queue itself was LONG, REALLY LONG. The ride itself only takes about 2 minutes, and it goes fast – slow – fast – slow. It’s kind of like Big Thunder Mountain, not really scary. I did manage to get video of the ride, but it was so dark you can’t really tell what is going on. It was fun, I got off the ride with a smile on my face. The guy in front of me in the car said that this was his 5th time riding it. It was an incredible night, my feet are still killing me, we walked a lot, but had a lot of fun. Best part is there will be another party next week, we’re bringing two of our friends, I hope they have a fun time. I’m also curious if the characters will be the same or if they will be different? We’ll see. Thanks for reading, if you have any questions or comments, please leave them below. 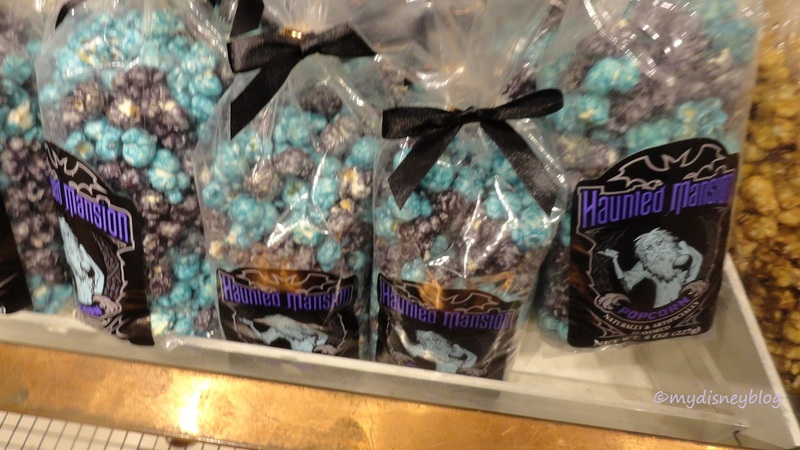 I know many of you who read my blog are also Disney fanatics. 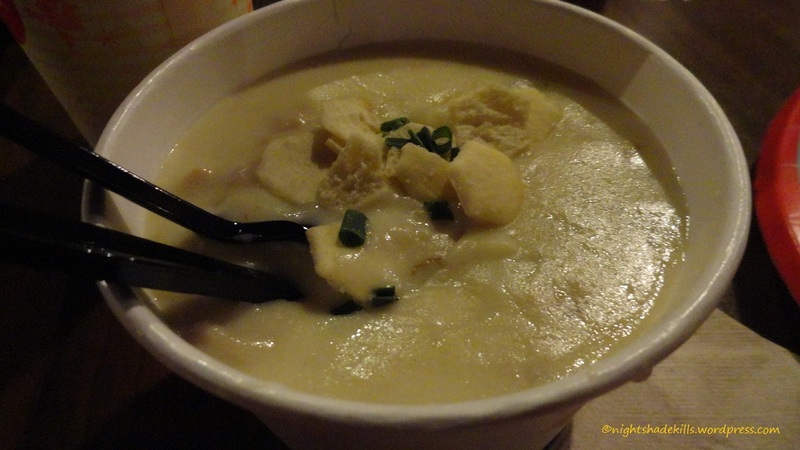 I thought I’d share a little bit about my post-Disney vacation blues. The first time we took a “real” Disney vacation – stayed on property, we had the BEST time ever. We’re not new to Disney, we’ve been annual passholders for going on going on 2 decades, but attending the parks for a day versus staying at a Disney hotel was different. We have stayed at local Orlando hotels in the past and that was not ‘magical’, and for any one who has stayed off property vs. on property would probably tell you the same thing. On our first real Disney vacation we stayed at Wilderness Lodge, a deluxe resort surrounded by lots of pine trees and nature. 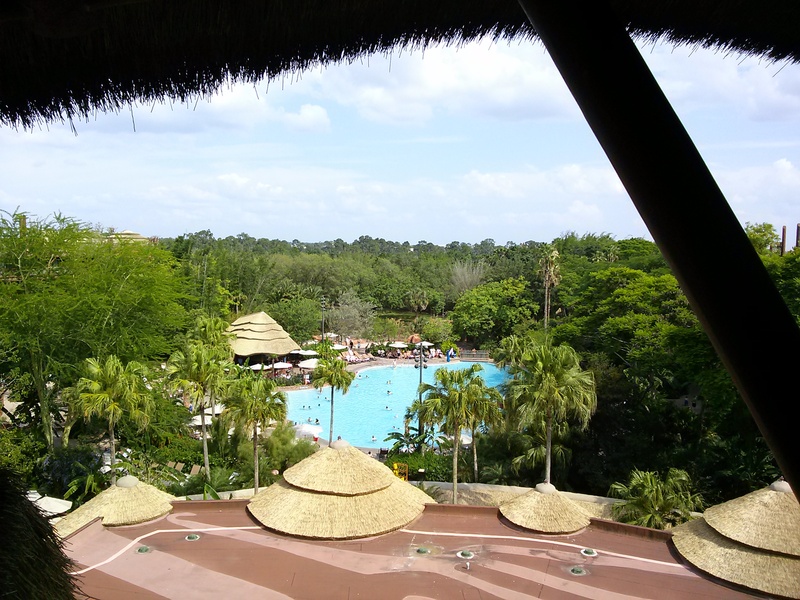 Our room had a perfect view of the quiet pool, the weather was gorgeous, and every moment was spent literally at Disney – we never left, we parked our car and that’s where it stayed for the whole time. I had planned our itinerary in detail, we had a Keys to the Kingdom tour at Magic Kingdom, Afternoon Tea at The Grand Floridian, dinner at Artist Point. We walked up and down Main Street, ate gooey cinnamon buns from the Main Street Bakery, we pin traded, rode our favorite rides, bought souvenirs, basically this was the closest experience to what I imagine tourists feel when they come to Walt Disney World. There were a lot of ‘firsts’ in this trip, first time doing a guided tour, first time sleeping and waking up on Disney property, first time eating at some new places, first time swimming in a Disney pool. It was amazing. But when it came time to go home, I started feeling severely depressed. On the car ride home, I was just plain sad. We live close enough to drive to WDW, this was crazy; I kept telling myself that this was crazy, we had passes, but this was different. Just the hotel cost was pretty high just for 3 nights it was near $800 with our AP discount rate, and that, ladies and gentlemen, made it pretty much out of reach. Plus the additional costs of the tour, meals, etc. We’ve never spent that much (per night) on a hotel room in our lives. For two days, I was deep in a funk. After two days of stewing, I finally rationalized or realized how we can just go back to stay at Disney. Can you put a price on happiness? No. But I suppose you can assign it a cost and budget for it! I’ll plan another trip, maybe 2 days and that would be less money. I justified it by saying that we never go on vacation ever, and I’m frugal with money anyways, and this would be like staycationing which is a ‘thing’ people do now just to get away from regular daily life. From the moment I decided to plan another stay, the Disney blues started to clear, I was getting excited about planning a new trip and I realized something that so many Disney Fans out there know from experience – always be planning your next Disney vacation, whether it is this year, next year, or five years from now. This is probably why Disney offer what they call “bounce back” offers, they start to try to sell you your next vacation while you are still at Disney, they offer reduced rates on a follow up trip, perhaps 40% off accommodations. Disney does offer value resort accommodations at Pop Century or All Stars, and Art of Animation, which do cost less than their Deluxe Resorts. I know that there are people out there right now who plan their imaginary Disney vacations – and that is good too, because just planning it helps. I dream of one day taking a Disney cruise and staying in one of the Disney suites, the Roy or Walt Disney luxury suite. I still get a little tiny bit bluesy from time to time, if I haven’t gone to Disney in a while, just like if you haven’t had your coffee for the day – it feels like something is missing. Sometimes I just wish I could magically teleport to WDW like a wizard or like they do on Star Trek. When I get like this I’ll watch a Disney movie, or we’ll do an Epcot inspired theme night, buy different foods from a certain country (or countries) and watch travel shows like Rick Steves or Rudy Maxa. I am happy to say that within about a year after our first real Disney vacation (after several staycations that year), that I discovered and researched about Disney Vacation Club, I scoured the internet, read Disney forums, talked to a friend who we met at WDW who was a DVC owner, looked up everything about DVC resales and ultimately we decided to really go for it and buy a used DVC timeshare. The process was relatively easy, there is a waiting period where Disney can opt to buy the contract from under you – Right of First Refusal they call it, but we had no problem with our particular contract purchase, it took about 90 days from day we signed our papers to close the deal. It was a little scary, we have never spent so much money on a luxury item as that in our lives, but I can honestly say without a doubt – it was the best thing we’ve ever bought ourselves and we know that we will continue to use it for the rest of our lives or at least until 2054 when our DVC contract expires. The annual dues are manageable, they offer monthly payments at no interest, and our annual dues are basically the same cost as 3 nights in a Deluxe Resort at regular price, but we can manage to stay and average of 14 nights a year. In the end, our Happily Ever After was buying a DVC resale, however cheesy that is, but it is saving us so much money AND we can actually share it with our friends and family and have some really magical memories. I am delighted by Disney Vacation Club, they have special member events during the year, the biggest is probably the Merry Mixer which happens in November/December, last year there were 5 dates available, they throw a two hour private party for the holidays at Epcot, they provide light refreshments and give each family a DVC Christmas Ornament as a keepsake. This year is the 25th anniversary of DVC and they have some new things planned which look like a lot of fun. How do you do Disney, do you currently have a Disney vacation planned? Have you ever felt blue after going on a great vacation? 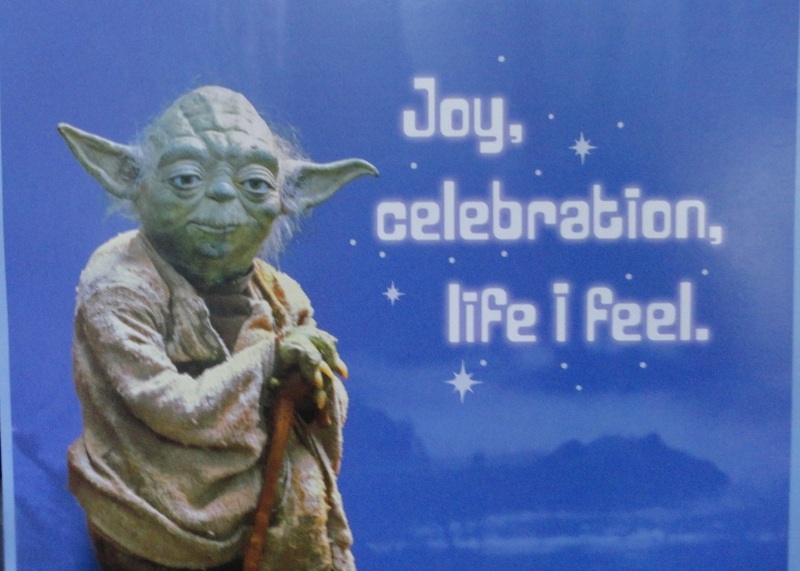 I love celebrating at Disney (Walt Disney World). Spending your birthday or anniversary at Disney just seems so much more special (dare I say, magical even? 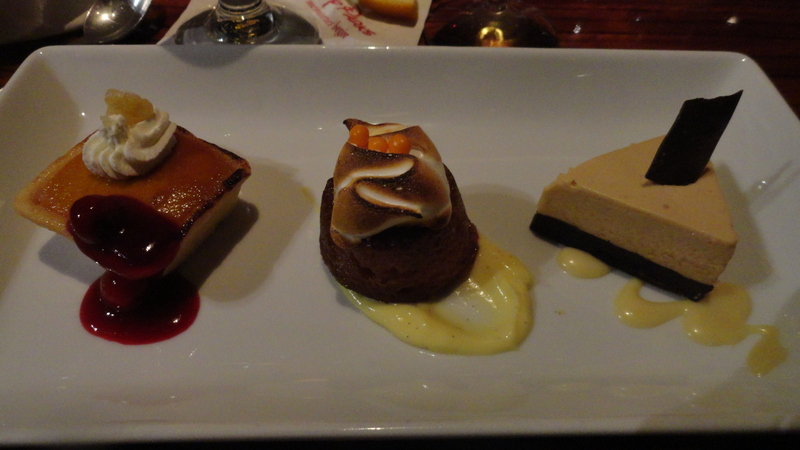 ), elevating it to a “Disney Birthday” or “Disney Anniversary”. 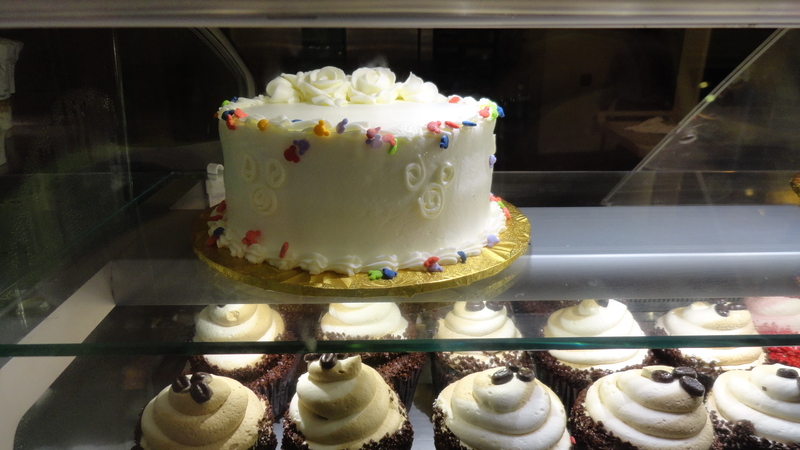 Heck, you can celebrate anything at Disney, even an un-birthday! Why not? Being at Walt Disney World gives you a little room to be silly, to be yourself, and to have fun. Part of the fun is planning ahead of time. Choosing where to go and what to do, where to eat, what rides or shows to see. Whether or not to book a special tour, VIP experience, or signature dinner? Which Disney Resort to stay at? There are so many different experiences waiting to be had, you can plan something that is just right for you or the honoree. If you enjoy some added attention, you can get celebration buttons at your Disney Resort or at Guest Relations, they say things like: “I’m Celebrating”, “Just Married”, “1st Visit”, “Happy Birthday”, etc. Cast members usually acknowledge your celebration if they see your button. Every once in a while a cast member might really do something to make your birthday even more special, I particularly love the small Disney birthday cupcakes. Just being at Disney for my birthday is amazing, whether it’s eating quick service Japanese food and watching Illuminations, or eating at Cosmic Ray’s inside the Magic Kingdom and watching Sonny Eclipse at midnight as it turns my birthday! I’ve spent many birthdays just being at the parks and riding rides, or just going to dinner. Nothing fancy at all, just being there. 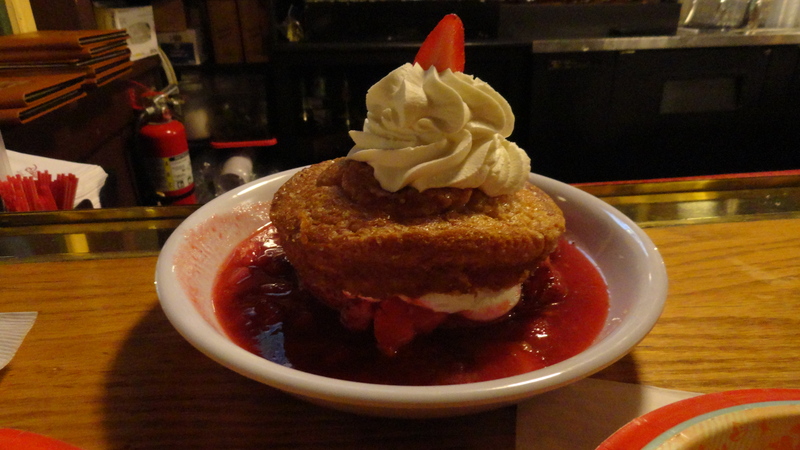 Nothing beats the Strawberry Shortcake at Fort Wilderness. As I’ve gotten older, I try to plan something special for our birthdays each year. With our Disney Vacation Club timeshare, it makes it easy and affordable to book a hotel room with our points for our birthdays or anniversary, or for anytime we want to stay at WDW, like for Flower and Garden Festival or Food and Wine Festival. 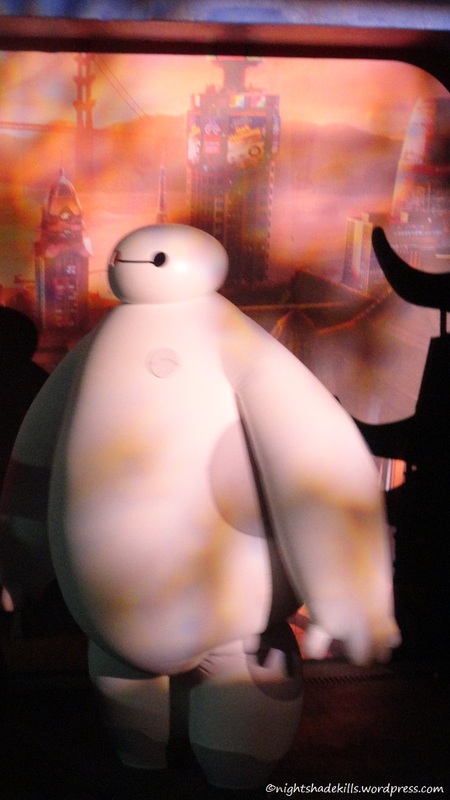 Special tours can be pricey, you can check out what Disney offers at their website. We did the Wanyama Safari last year, it’s a tour around Animal Kingdom Lodge with a zoologist/safari guide, and then a Signature Dining Experience at Jiko. A celebration is even more special with fireworks! 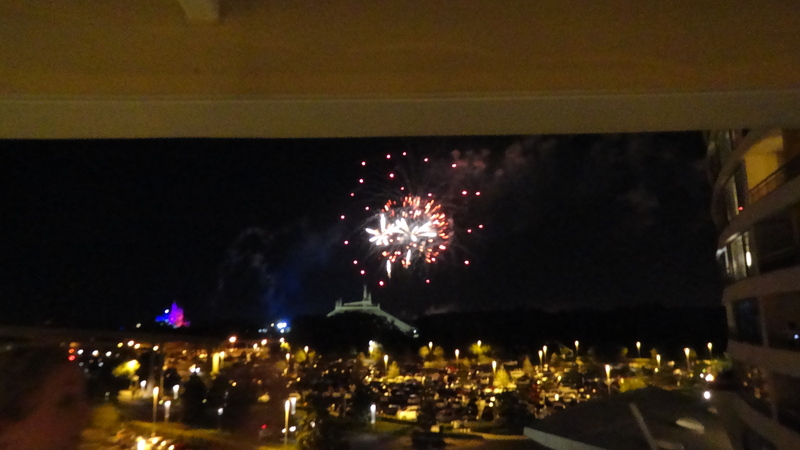 Thankfully, Disney has that covered, you can enjoy fireworks everyday of the year at Walt Disney World. Hope that all your celebrations can be Disney ones!